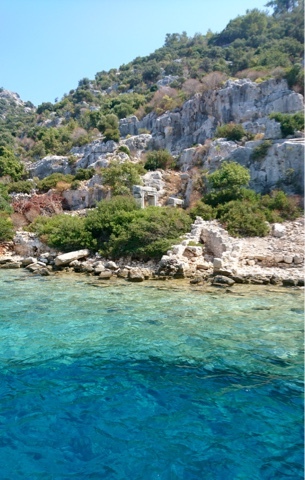 Yesterday we visited Kekova and the sunken city of Simena on a boat. Gee enjoyed swimming in the sea off the boat but I just sat and took in all the atmosphere. The last couple of days have been horrendous with bad news from back home and it is quite hard to continue enjoying your holiday when a loved one is gravely ill. We have to remain positive and pray that remission will succeed again. Wow, what a stunning view! Thanks for sharing your photos from the other side of the world. I hope your poorly relative is feeling a bit better-sorry to read that news. Beautiful photo! I love the colours. Sorry to hear about your relative. Keep positive. That is a beautiful sea, even if your mood was dampened by bad news. I am so sorry to hear about your bad news. This photo looks like a watercolour, the colours are beautiful. What a beautiful view. I hope that you'll be getting word of a turn for the better for your loved one soon.